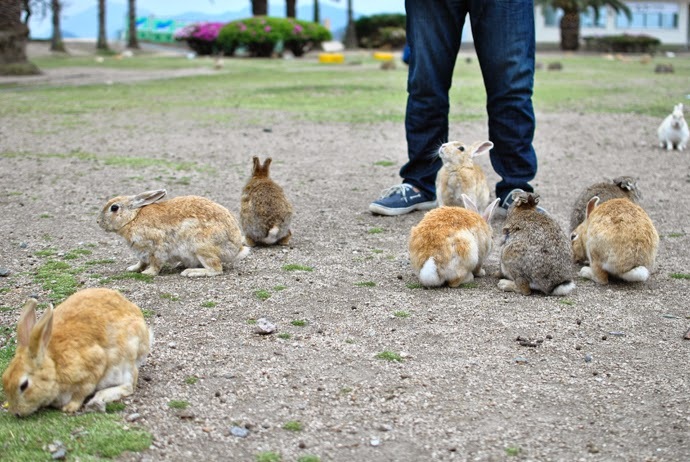 Rabbit Island. Yes, you read that correctly. I mentioned this place in my Japan inspiration post and I was delighted that we were able to make it here. Actually, it was really a non-negotiable part of the trip for me and Dai happily obliged. 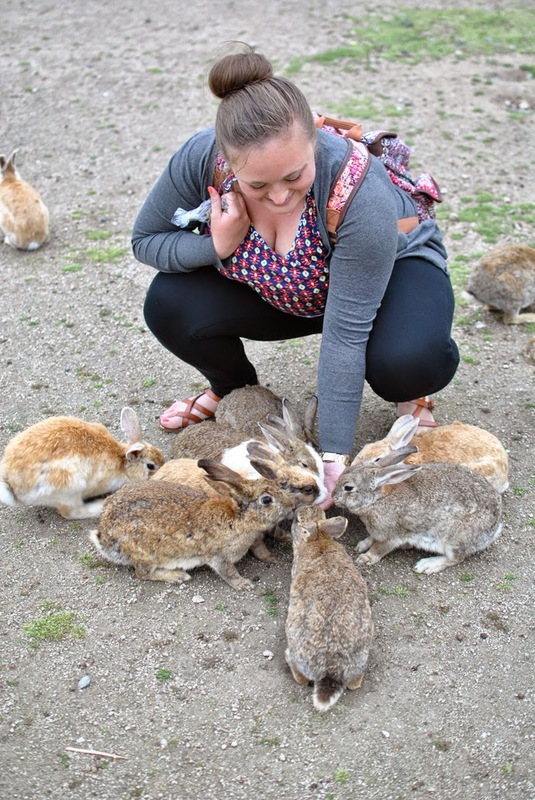 This island, formally known as Okunoshima, is known for its large population of rabbits. There are a few theories of how this came to be, but basically as soon as you walk up from the ferry dock, there are rabbits waiting there to greet you. And there are tons more wherever they came from. 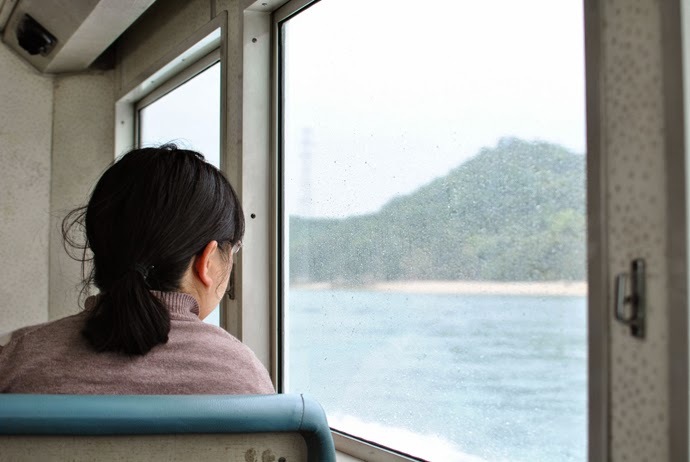 We spent the morning wandering around Hiroshima and then took about an hour long train ride to Tadanoumi Station, where we were then able to catch the ferry over to Rabbit Island. 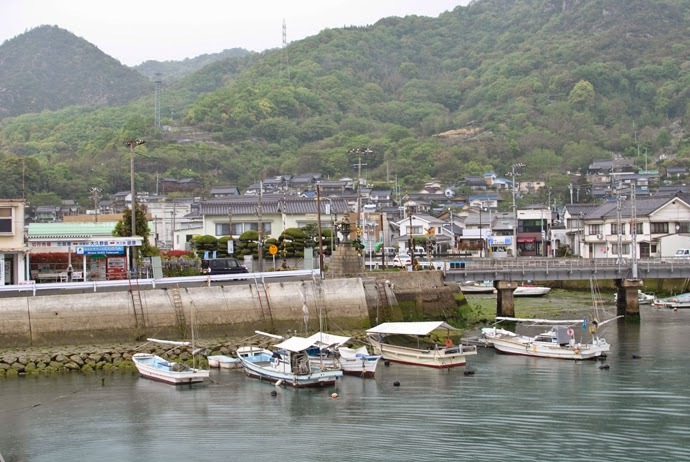 As the train slipped further away from the city limits of Hiroshima, the scenery drastically changed to a more country-side like view of Japan. It rained on and off this particular day and we were worried about our visit with the rabbits being cut short because of it. 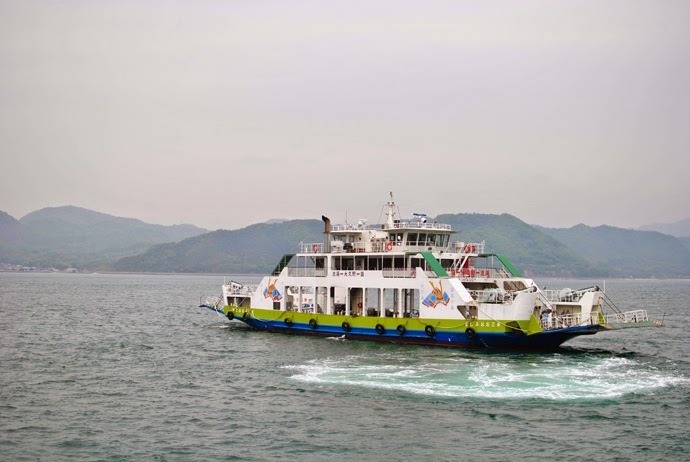 Even though it rained on our ferry ride over to the island, by the time we arrived it was not raining anymore. From the dock, we took a free shuttle bus up to the hotel on the island, where tons of rabbits lived on the front lawn. It was hilarious riding the bus and looking out the window along the way because there were rabbits hopping along everywhere. 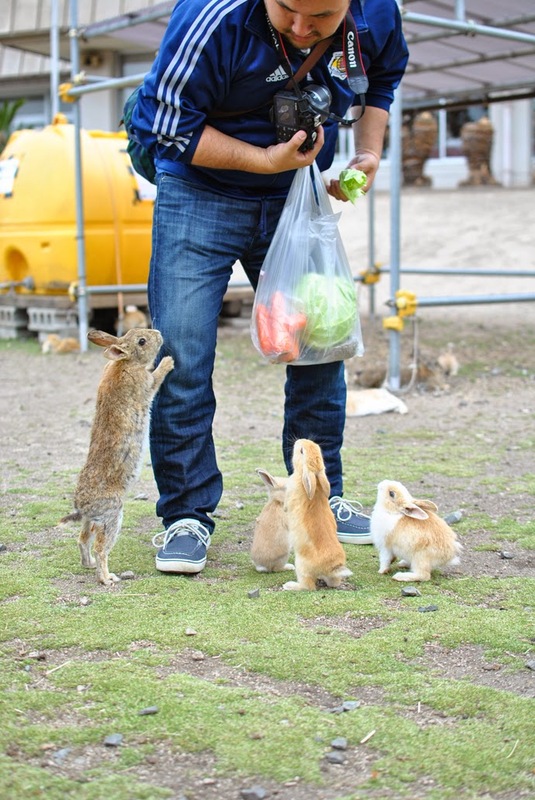 We had stopped at a local market to get some cabbage and carrots to feed the rabbits, as well as a package of rabbit food. 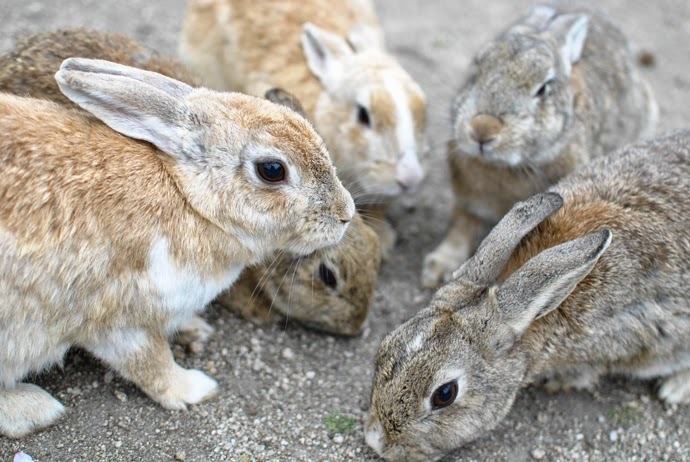 It was definitely nice to be able to hold your hand a safe distance away from the rabbits when feeding them veggies, but often one brave bunny would grab the whole thing and run away with it! I think I preferred feeding them the pellets from my hand as long as I kept my palm flat because it attracted more rabbits at once and I didn't have to worry about any of them stealing from me. 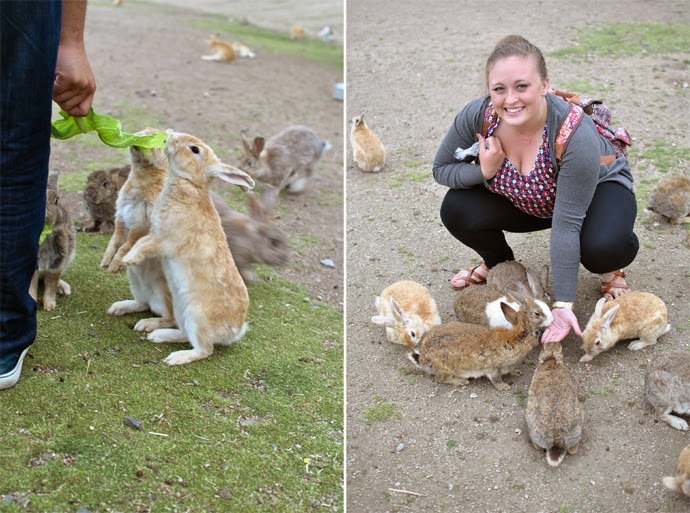 I was amazed by how sweet all of the rabbits seemed to be. Every so often they would get a little annoyed with each other and push one another around a bit, but they were never aggressive towards humans. Don't bite the hand that feeds you, right? They were all just so cute and I wanted to cuddle every one of them. For a good long while after that, I was convinced I wanted a rabbit, but then I remembered that I had a little black dog that would not be happy about that choice. Unfortunately, we were told not to try to pick any of them up and of course I understood why, but I was just crazy enough to want to do it haha. I constrained myself though, so don't worry! 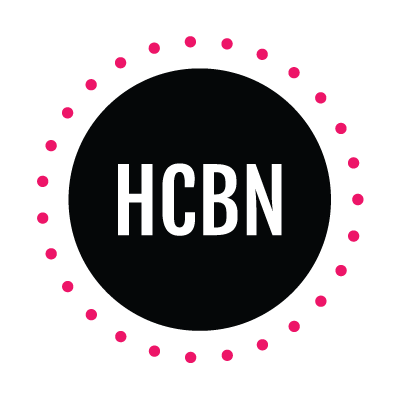 Would this place make your travel list? 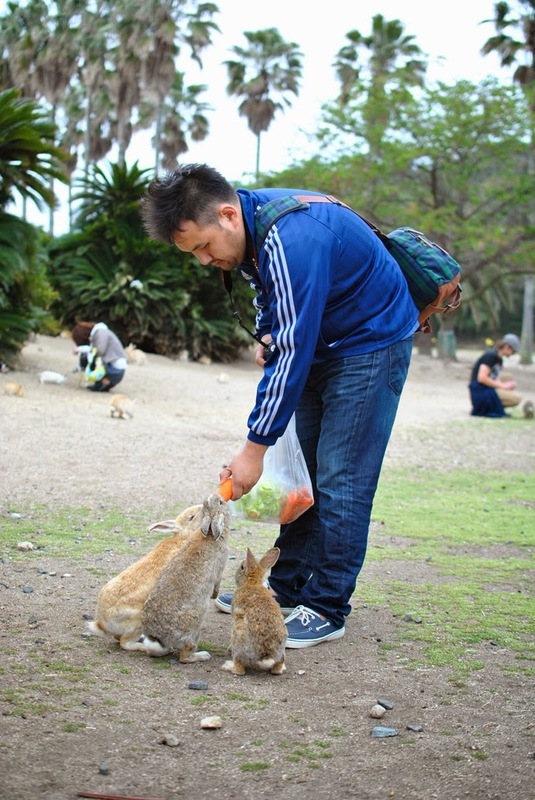 How do you feel about rabbits or visiting with wild animals? Oh my friggin' goodness!!! 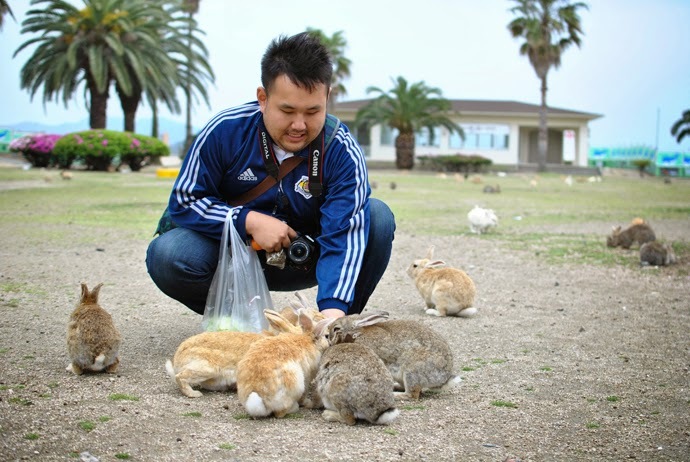 I love rabbits so much, I would go to Japan just for this reason. There's a couple of rabbits on my block that just had babies and now there's a constant view of rabbits on my lawn, and the one baby hangs out in my back yard during the day and it's so cute! I just have to be careful my dog doesnt see him. The only thing about it though is they eat all the Lily of the Valley and one of them pulled out my lilies! I've been really looking forward to this post! BUNNIES!!! 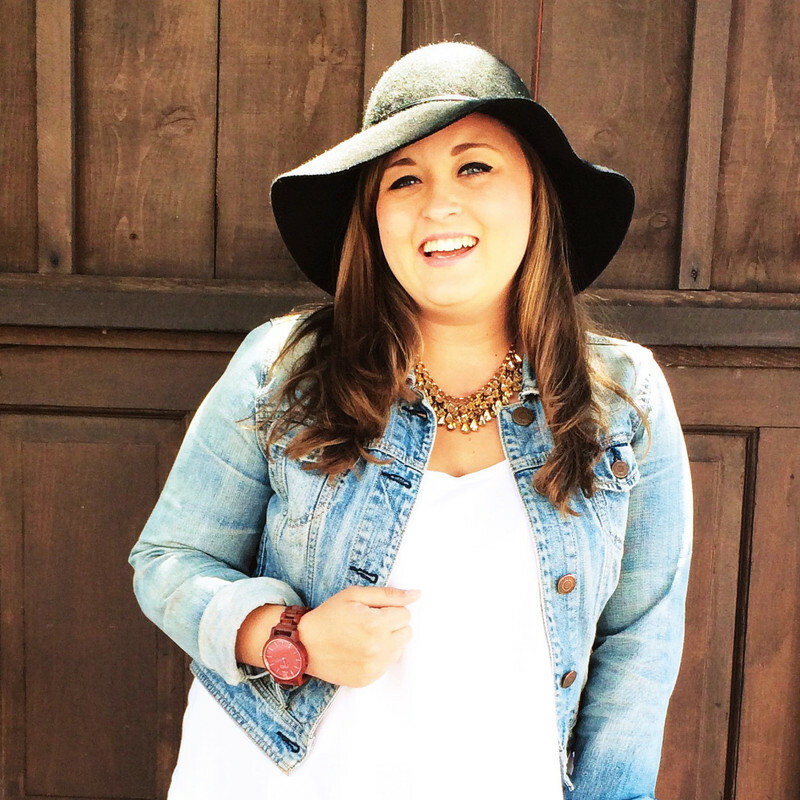 So adorable, I need to visit for sure <3 Lucky you, Jess! This would probably be my #1 travel destination!!! 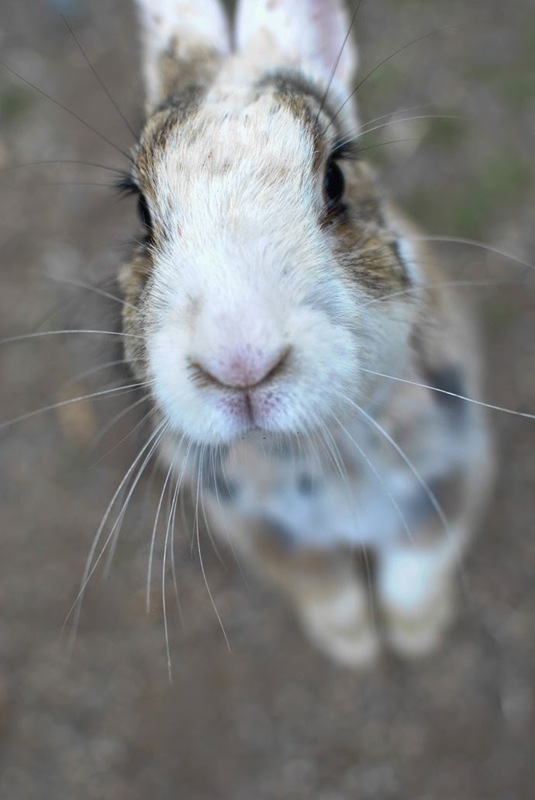 I love rabbits and this is way too cute. D'awww! I can't handle all the cute! What a dream : ) this would have been a must on my list too and will be if I ever get to travel to Japan. Yeah! I highly recommend it! 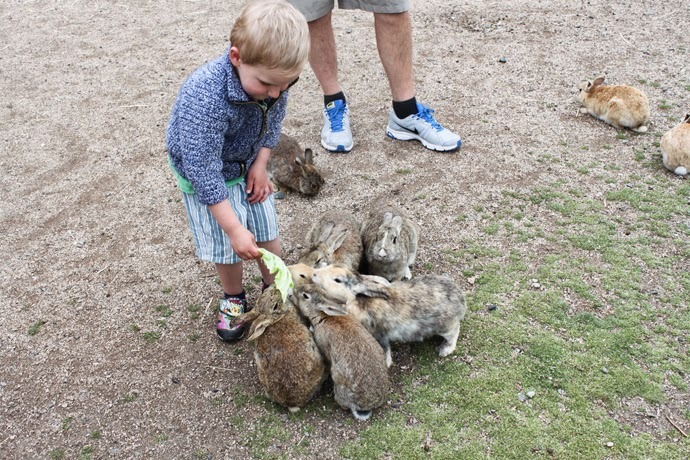 I mean, bunnies. Where could you go wrong? Awww that's so cute!! I know, my dog totally would not love having a little bunny sibling haha that would last about 5 minutes. Bummer that they eat your dang flowers though!